Already a celebrated fixture on the San Marcos campus, the Maintenance and Operations (M&O) complex combines energy-saving features with a host of functional upgrades for the college’s Facilities Department. 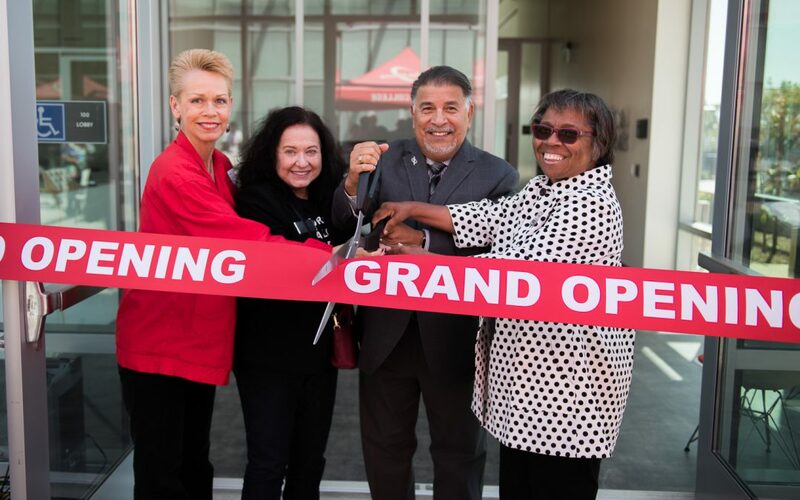 Pictured above, left to right: Palomar College Governing Board Trustee Norma Miyamoto; Trustee Nina Deerfield; Board Vice President Dr. John Halcón; and Superintendent/President Dr. Joi Lin Blake. SAN MARCOS, CA ― On a picture-perfect afternoon at Palomar College, officials and guests gathered on Friday, April 12 to celebrate the opening of the award-winning M&O complex that cuts a striking presence off West Mission Road with clean lines of brushed metal and glass. Recognized by Engineering News-Record (ENR) Magazine as a national “Best of the Best” project in green design, M&O won wide acclaim before it was even occupied. On Friday, the college celebrated the official opening with a ribbon-cutting ceremony. The complex consists of an “Operations” building, most visible from Mission Road, that houses administration and other staff offices and conference rooms. The larger building to its north is the “Maintenance” building and includes a break room, warehouse, and shops and work areas for the various skilled trades that a part of the college’s Building Services. Together, the complex comprises 27,000 square feet. Have Palomar News sent to​ your inbox!